Thalia’s mother had taken her trick or treating, allowed her to snack on some of the loot, given her a bath, and now Thalia, with Teddy dragging behind, is in my study, a demonic gleam in her eye. For a moment I consider Blue Beard, but judging her tender years, I settle on another. “Tell me.” Thalia and Teddy settle into my lap. A sorcerer kidnaps young women with the intent of marrying them if they can pass his test. He declares he must journey for a few days and leaves the girl with an egg, which she must carry with her, and the keys to the manor, which she may explore with the exception of one room. He even points out the key it is she must not use on pain of death. The sorcerer has captured the eldest of three sisters and puts her to the test. Inevitably, after her explorations of the manor, she finds herself in the forbidden room facing a basin filled with the hacked-up bodies and the blood of the women who entered the room before her. Trembling at the sight, she drops the egg she carries and it falls into the bloody basin. No amount of cleaning will removed the stain on the shell, giving her away upon the sorcerer’s return. Thalia’s thumb is in her mouth. She hasn’t done that for some time. I am hoping I haven’t crossed the line with this choice. The sorcerer returns to the abode of the sisters and steals the second eldest and the scenario repeats itself. The third and youngest sister, in true fairly-tale fashion, is a different matter. She stashes the egg safely away before heading directly to the forbidden room. There, with unexplained wisdom, she pieces the body parts of her sisters back together, restoring them to life, then hides them in another room. “Whew!” Thalia is relieved and her thumb released from duty. Appearing to have passed the test, the bride now demands the sorcerer carry a basket of gold to her parents before the wedding. In the basket she conceals her sisters, instructs the sorcerer/bridegroom not to rest or tarry, and says that she will be watching him from a window. She puts a decorated skull in the attic window as her decoy, but it is her sisters’ voices from inside the basket that goad the carrier on, allowing him no rest. Meanwhile, the bride dips herself in honey, rolls in white feathers, and goes outside to greet the wedding guests, the sorcerer’s nefarious companions. The sorcerer himself does not recognize her, thinking she is the bejeweled skull in the attic window looking down on him. Help, sent by the sisters, quickly arrives, shuts up the house with the sorcerer and wedding guests inside, and burns it down. Content with just the right amount of fright for a Halloween night, Thalia and Teddy toddle and drag themselves off to bed. I stand before a forbidden door, my own personal forbidden door. It is a physical door, quite ordinary, dull really, unlike the forbidden doors I imagine in fairy tales. These doors stand apart from all the other doors, at the end of long, dimly-lit hallways, panel doors of heavy, dark wood, not ornate in any way, except for doorknobs made of glass. Their keys are plain, unassuming, on rings with other keys. There are no skulls and cross-bones emblazoned upon them to alarm those that hold them, yet they have been warned not to use them. What is behind the forbidden doors? In The Fitcher’s Bird, as well as in Blue Beard, andMister Fox, it is the dismembered bodies of the victims who have gone before. Is it always that gruesome? By no means. In Virgin Mary’s Child it is nothing less than the Holy Trinity. In another tale, The Quest for the Fair One of the World, found in Modern Greek Folktales, by R. M. Dawkins, behind the door is the painting of a beautiful woman. In the case of The Fitcher’s Bird behind the door is a horror, the manifestation of a twisted, evil mind. The heroine, using the sorcerer’s own magic against him, overcomes the villain with cunning. In Virgin Mary’s Child, behind the door is knowledge beyond the ken of man that the heroine is bold to touch. Denying her actions, she suffers at the hands of the Virgin Mary until confessing her sin. Quest for the Fair One of the World has three brothers, each smitten in turn by a portrait’s image, and each setting out on impulse to find her. Two of them lose their heads, while the third and youngest succeeds. These tales present three different conundrums behind each door. What do they hold in common? In each case, when the door is opened, the life of the hero or heroine profoundly changes. Behind the door waits a path for the bearer of the key, taking them to their fate. Turning the key unlocks a future, for good or for ill. The door can be closed again, but what was inside cannot be shut away. 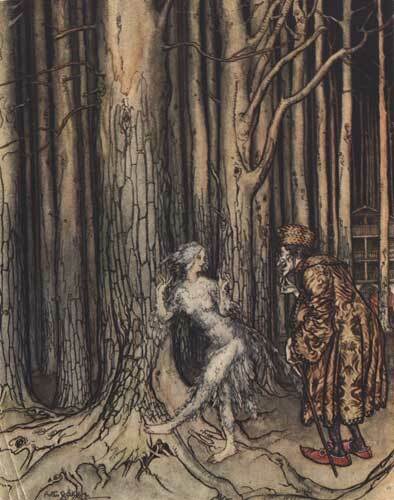 The forbidden door is not the only device of no return in the fairy-tale lexicon. The box to which the heroine has the key (Pandora’s not being the least of them) fulfills the same purpose. In the White Snake the device is simply the lid of a covered dish, there being no key involved. Another fairy-tale device of no return is the crossing of the threshold, that well-known step in the hero’s journey. But the forbidden door is different. In crossing the threshold, the protagonist has made a decision to heed the call to adventure. Opening the forbidden door is done out of the weakness of spirit, not anticipating the consequences. What I find compelling about the forbidden door is that I am more familiar with being weak-willed than being heroic. I, too, have the impulse to open the forbidden door, and I take solace in the fairy-tale message that this action too can lead to growth, bringing us to the next level of awareness as much as the hero crossing the threshold. I am still facing my forbidden door. It’s a cupboard door, actually. I open it and take out the crackers and Nutella. I am only going to have three. Maybe four. I return to my study with a plateful of Nutella crackers. I won’t tell you how many. The Fitcher’s Bird contented Thalia as a Halloween story, but the more I think on it, the more I am bothered by the rhyme at the end. When reading a fairy tale, it is not uncommon for me to feel there is more to the tale than appears on the surface. When I contemplate the tale its layers emerge as I consider what the story elements mean to me. Like other works of art, I am prompted to insights not made before that bit of creation revealed them to me. I am seeking creature comforts as I build a fire in the hearth before settling into the crackers. The Fitcher’s Bird brings up my fairy-tale anxieties. As usual, I sense there is more beneath the surface, but there my understanding stops. I haven’t the means to penetrate further. Here on the surface is what I can see. Bird references imbue the tale, starting with the title. The sorcerer gives the sisters an egg to carry with them as they explore the manor. This egg betrays the first two victims. The youngest sister manages the egg better, not letting it reveal the truth. She disguises herself as a bird by coating her body with honey and rolling in feathers from a mattress she tears open. (Her wedding bed?) In this manner she greets the wedding guests and her would-be bridegroom, participating in the following rhyme. 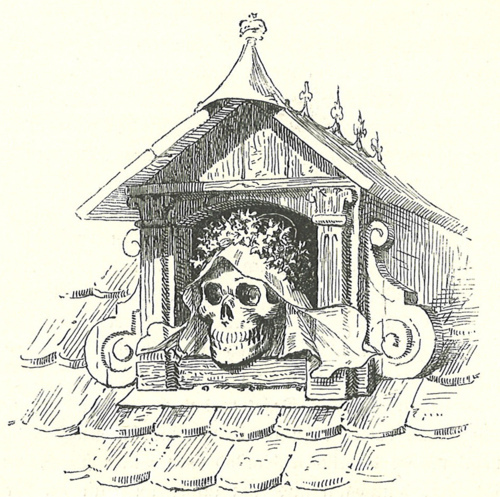 A skull looks out the attic window, one that she has decorated with jewels and flowers as a decoy. What are we to make of this rhyme? 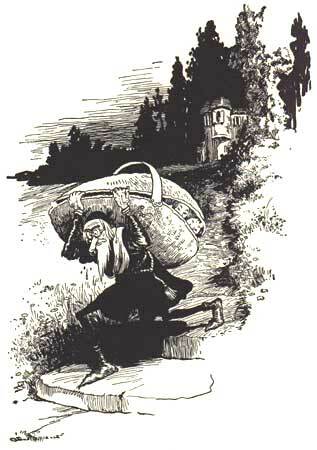 The word “Fitcher” in German suggests “wing” or “feather.” The rhyme suggests the sorcerer’s name is Fitze Fitcher. He has the sisters carrying around eggs. I can’t help but note the story leaves the youngest sister in her bird-like state. She doesn’t get to go home, clean up and marry someone else. All of these avian references point to . . . I am nagged by the thought a riddle may be involved, but I am not getting subtle cultural references, notions in place when a teller first spoke this rhyme. If I were to update Fitcher’s Bird I would consider Thalia’s cultural relationship with birds. Her knowledge of chickens is filtered through supermarkets and fast food. Being a city girl I dare say she has never held a live chicken. I would have the youngest sister dipped in honey and rolled in breadcrumbs to pass herself off as a nugget. Thalia would immediately get the joke, while someone from a nonbreaded-chicken-cuisine subculture would not. I believe that is my dilemma. That, and the empty plate with a little smudge of Nutella left behind.